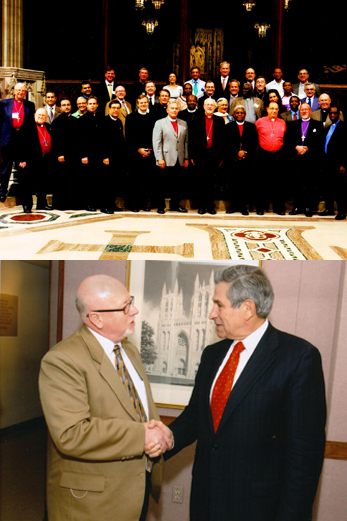 Leaders from World Evangelical Alliance will join more than 30 leaders of Christian denominations worldwide in a gathering at Washington National Cathedral on Sunday, Sept. 11, to affirm the UN plan to halve extreme poverty by 2015 and propose stepped up action to eradicate poverty throughout the world. Participants will call for a recommitment to achieve the Millennium Development Goals as laid out by UN members in 2000. The event, “Consultation of Religious Leaders on Global Poverty,” will open with a series of worship services and lectures in the Cathedral nave, including a 2 p.m. speech by Dr. Jeffrey Sachs, director of the Earth Institute at Columbia University and special advisor to U.N. Secretary-General Kofi Annan. During a 4 p.m. service of music and prayer, featured speakers will include the Most Rev. Njongonkulu W.H. Ndungane, archbishop of Cape Town, ; and former U.S. Secretary of State Madeleine K. Albright. All events in the Cathedral nave on Sunday, Sept. 11 are open to the public and free of charge. Media coverage is welcome. Beginning Sunday evening, the Christian leaders will enter closed consultative sessions that will extend into Tuesday, Sept. 13, after which a delegation will travel to New York to present the group’s communiqué to the U.N. Although the three-day conference’s meetings will be private, the Cathedral’s Office of Public Affairs will be able to arrange limited media availabilities with participants. Geoff Tunnicliffe , WEA international director, Ndaba Mazabana, WEA’s international board chair and Michael Smitheram , WEA Micah Challenge international coordinator will participate in this strategic gathering and will be available for interviews. “The upcoming consultation on Global Poverty provides the religious communities with a tremendous opportunity to reflect together on ways we can be part of the solution in the fight against the ‘giant’ of poverty which ravages so many of our peoples. It is my sincere hope that our contribution, informed both by our faith and deeds, will help make a big difference,” says Rev. Ndaba Mazabane . World Evangelical Alliance is a global network of 123 nations who each have formed an evangelical church alliance. Nearly 3,000,000 local churches and 380 million Christians identify with these alliances.